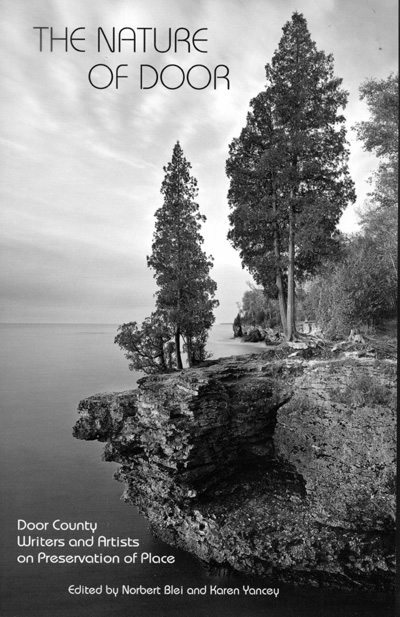 Editor’s Note: Six years ago my small press, Cross+Roads Press, was approached by the Door County Land Trust to help put together a book of nature writing for them (essays and poems) reflecting the natural wonder and beauty of this landscape we inhabit and seek to secure. I gladly took on the project even though this was not ‘officially’ a Cross+Roads Press book reflecting my original intent (to publish a ‘first’ chapbook of poems, essays, fiction, etc. by a serious writer in need of attention) but, instead a ‘cause’ if you will …a potentially important ‘local’ book-idea that needed a publisher and editor. Writer and Land Trust member Karen Yancey joined me in soliciting and editing the manuscripts that eventually became: THE NATURE OF DOOR, Door County Writers and Artists on Preservation of Place. 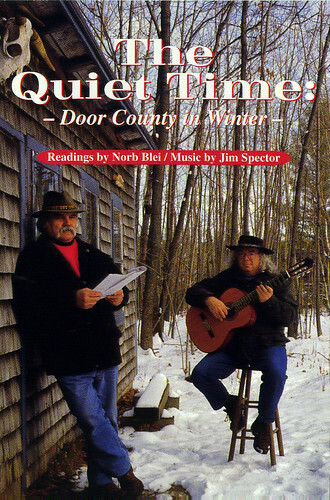 This remains among my favorite books on Door County, truly one of the most beautiful, inside and out: from the stunning cover photography of local (and world class) photographer, Dan Anderson; the quiet but profound pen and ink drawings throughout the book, taken from the sketchbooks of our most illustrious artist, Charles (Chick) Peterson; and the gifted poets and writers who put their sense of place and preservation in their own beautiful words. 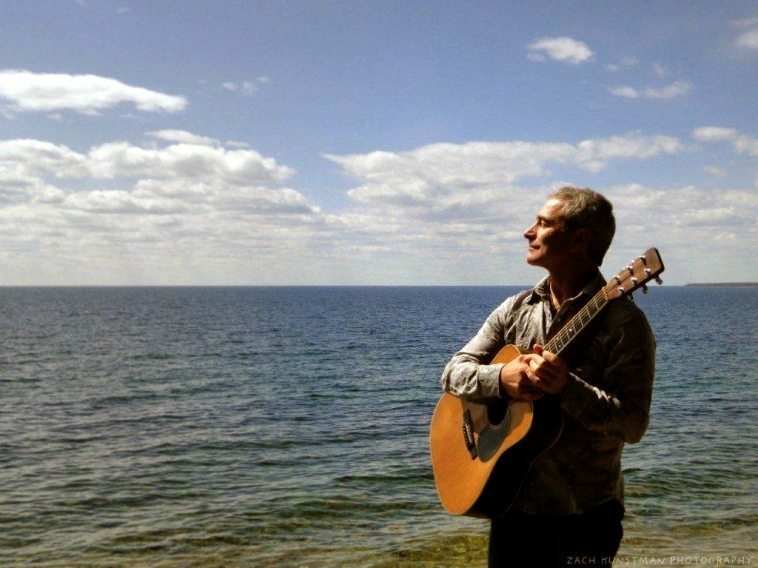 Among them, singer, songwriter, musician, Julian Hagen, a Door County original who lives and breathes and writes and laughs and sings (a born storyteller as well) on Washington Island, a little piece of separate Door County earth, just north of the peninsula. Around that time of year when the northern lights appear, I always think of him—and his signature song. “Northern Lights” was written in 1973 in the barn while milking cows before going to school. I was a junior in high school. I smile thinking back because a milking machine works in 2/4 time and the song is written in 3/4 time. Music was so important on the Island both for entertainment as well as a way to interact. Many Island nights were spent sitting around a campfire or in a living room playing and singing. It was a magical time. I just decided one day to try and write a song and did. 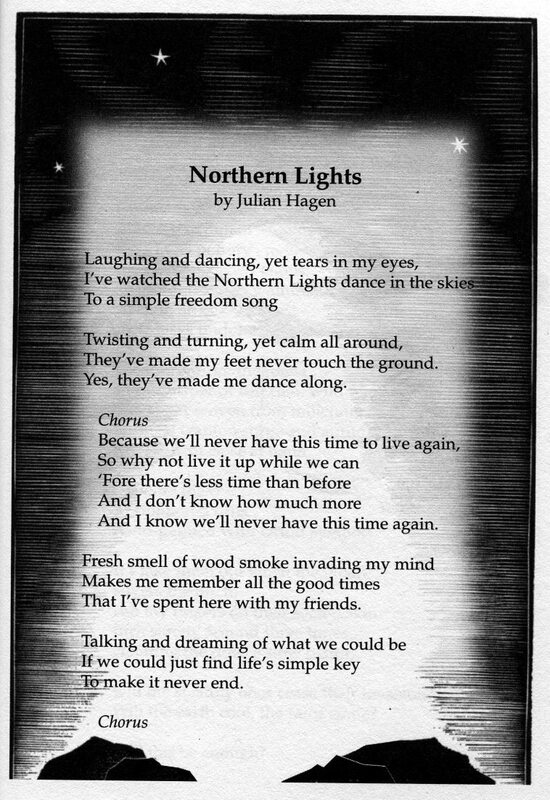 “Northern Lights” was my 2nd composition. Ah, the words. I was wise beyond my years. My youthful outlook was not cluttered with all of the “stuff” that gets in the way as we age. I’m not sure about the idea behind the song — Living it up while we can, celebrating friends, life and nature. I just remember being aware of how blessed I was. In the first verse, I refer to the northern 1 lights. I remember getting my sister out of bed at 1 in the morning to go for a motorcycle ride while the lights were dancing in the sky. I had a 1964 Honda Dream with a single carb, and we would ride along with the headlights off. A number of my songs are inspired by island life and experiences. Sadly my “wild” is different than the “wild” of the Island and the county of today. Back then, we lived predominately off and with the land, were intricately linked to our neighbors. We could walk across the Island and not be considered “trespassers.” My idea of “wild” also involves a way of life. Changes on the island happened quite subtly. It was like being next to someone growing older. You may not notice the changes, but for those who are more aware or come back after an I extended period of time, the change can’t be missed. We certainly can’t go back. The same for the Island. Once damaged or gone, whether open places to roam, species, silence, dark skies, fresh air, or I fresh water, it is so hard to repair and perhaps impossible to regain. Norb, this is my favorite of Julian’s songs. Where can I get some copies of “The Nature of Door?” Sure wish we could buy you a cup of coffee. My sister, Linda, is here from Florida until next week Wednesday. Any chance we could lure you out of the coop? through the DC Land Trust would be most financially advantageous for the organization itself (all profits to the cause) and the good work it does in protecting and preserving our county. where you can see him singing this song at Fiddler’s Green on Washington Island. However, I did see some of Julian’s CD’s at Base Camp Coffeeshop in Sister Bay this morning.